The KYD32 is suitable for the home, office or any small to medium sized room up to 80m3. It is very compact and robust in its design compared to others with the same cooling capacity and the power consumption and noise are especially low. In order to operate the unit an extraction hose needs to be fed out through a slightly opened door or window. An a shaped fitting supplied tapers this hose into a very thin outlet about 5cm wide. This enables it to be vented out of a letterbox or slightly open window. For a more permanently cooling solution a hole can be drilled through an external wall and the hose attached with the use of the 125mm exhaust vent kit. In a large office or not near a window, it is possible to vent the extraction hose above a suspended ceiling. A 3m exhaust extension hose is available. 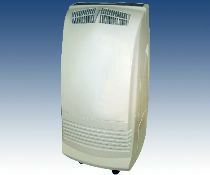 During the cooling process this air conditioner will also dehumidify, storing water that condenses inside the unit. This tank is easy-to-remove. 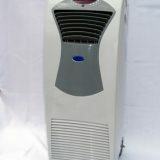 Unit has a cooling capacity of 3.5kW & a heating capacity of 2.5kW. The heating feature means that this unit is not redundant in the winter.